An interesting report regarding California’s carbon cap-and-trade program came out in September. This report, issued from the University of South California, presented a preliminary assessment on the effectiveness of the program in lowering state greenhouse gas (GHG) emissions and evaluated the impact entities who are covered by this act have on low-income communities and communities of color. This post describes the findings of that report. For those who need a refresher, the State of California passed AB 32 in 2006 in response to a growing environmental crisis. AB 32 requires a reduction of GHG emissions to 40 percent below 1990 levels by 2030. The California Air Resources Board (CARB) developed a Scoping Plan that lays out California’s strategy for meeting this goal. While not explicit in the Bill, a carbon cap-and-trade program was chosen as a core strategy. It sets a statewide limit on sources responsible for 85 percent of California’s GHG emissions, and establishes a price signal to drive investment in cleaner fuels and energy. The trading of allowances and use of offsets is made to provide covered entities flexibility in meeting their goals. The revenue generated from the program must be used for fostering job creation and economic opportunity, improving air quality, investing in projects that benefit disadvantaged communities, providing different businesses or organizations opportunities to participate in efforts to reduce greenhouse emission, and lessen the impacts of climate change per Senate Bill 535. How Effective Has Cap and Trade Been at Reducing Pollution? GHG reductions seem to be improving in California. However, the preliminary assessment has found that the bill has done little to improve the health and well-being of people that live in areas most impacted by fossil fuel pollution. 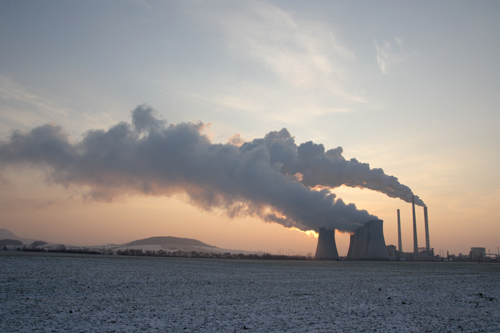 In particular, research has indicated that many carbon emitting facilities, which also emit other air pollutants, are disproportionately located in disadvantaged communities. Neighborhoods located within 2.5 miles of GHG emitting facilities have a 22 percent higher proportion of residents of color and a 21 percent higher proportion of residents living in poverty compared to other neighborhoods. Even as California’s GHG emissions have decreased, the report found that many sectors under the cap-and-trade system actually found increases in their localized toxic air pollutants. In fact, about 60 percent of the state’s largest polluters reported increases in their local emissions from 2013-2014. How does this make sense? To start, only a portion of California’s total GHG emissions are regulated under the cap-and-trade system and there are differences in the way facilities report data. For example, while facilities are required to report their GHG emissions yearly, their reports of other pollutants and particles only have to be reported every several years. Moreover, not all emissions that are regulated by cap-and-trade occur in state. While emissions from electrical power was shown to decrease by 1.6 percent from 2013-2014, disaggregated data reveal that emissions associated with in-state electrical power actually increased, while imported electricity decreased. This only further emphasizes that the system is not delivering lower local emission reductions in ways that benefit communities of color or low-income communities that live in neighborhoods close to GHG-emitting facilities. Lastly, the report highlights that more offset credits were used than the total reduction in allowable GHG emissions. The offset credits were used by many companies to satisfy part of their emission reduction. Ideally, these credits would be used for projects benefitting the environment and people of California. However, the report indicates that 76 percent of offset credits were used for out-of-state projects, and that companies that used these credits tended to have larger GHG emissions. These projects were related to forestry and the destruction of ozone depleting substances. While important, these projects do not improve the health and well-being of residents of California, and allow major GHG emitters to continue polluting. Moreover, 15 percent of the offset credits used during the first compliance period were generated by projects that had begun before the cap and trade program was implemented- posing a question as to whether decreases in GHG emissions were due to cap and trade in the first place. While the report doesn’t offer solid solutions to these issues, it does make several recommendations. It calls for better regulation on in-state GHG reductions among facilities in highly impacted neighborhoods. It also calls for improved data collection and transparency of information from the state and from individual companies. When asked about specific cap and trade reforms, Manuel Pastor, the report co-author from the University of Southern California, responded that “no trading zones” or prices increases for allowances tied to highly impacted areas are possible solutions. It allows for better regulation and also produces public health benefits for people who live in impacted neighborhoods. What Does California’s Cap Program Get Wrong On Climate Justice? The results of this assessment reveal large environmental justice issues in California’s cap and trade program that directly affect the evaluation of similar market based strategies in Washington. While cap-and- trade systems may reduce overall GHG emissions, the pricing mechanism does little to benefit the neighborhoods and people most affected by air pollution. As a result, communities of color and low-income communities are put at higher risk for poor health outcomes. If the right pricing mechanism is not put into place, the environmental and social impacts occurring in California could happen in Washington. Studies done by the Seattle King County Department of Health show us that people of color and people who are considered low-income live in highly polluted areas. This is apparent as we pass by neighborhoods such as South Park, South Seattle, and parts of Eastern Washington. These areas are located closest to where high levels of industrial or agricultural activity are occurring. There areas are also where rates of asthma, respiratory, and other chronic disease are highest among Black and Latino communities. Unfortunately, such illnesses are exacerbated by lack of access to important resources such as clinics, healthy food, social services, and living-wage jobs. This inequity and injustice is why it’s important to incorporate the needs of these communities into a comprehensive environmental policy. If we are not able to do this in Washington, we face similar issues that California is dealing with. What Does California Get Right? There are certain things California’s program does right. The revenue raised from the program invests in transportation and sustainable communities that reduce pollution with a share targeted to communities facing communities impacts from pollution and socio-economic disparities. For example, the state’s invests in programs that lay the ground work for approaches in zero and near zero-emission public transportation system may help highly impacted communities to gain access to resources and services they need, as well as access to increased economic opportunity. The opportunity to develop affordable housing close to these transit spaces also provides benefits for highly impacted communities. From equity and social justice lens, these are the types of reinvestments that should be incorporated into Washington State environmental policies. Furthermore, environmental justice advocates in California are working hard to make the existing program does better and any future cap or pricing strategies assure pollution reductions where they’re needed most. This year they passed several critical pieces of legislation. What Does an Equitable Climate Policy Look Like? Be responsive to the communities most harmed, those that are affected by the combined burdens of pollution and climate change, social and economic disparities, and institutional racism and discrimination. We can identify these communities through a “cumulative impacts mapping analysis” that identifies disparities and guides solutions. Be accountable to the most impacted communities, which can be achieved through an environmental justice oversight board. Charge major polluters carbon fees that drive down greenhouse gas emissions and pollution, especially in the most burdened communities in Washington, but without creating or obstructing reductions of pollution in highly impacted communities elsewhere. Cover its own costs, including a workforce transition and support for people with lower incomes; then, use the bulk of revenue from carbon fees for the transition to clean, resilient communities and create jobs, with dedicated and targeted funding to the communities most impacted. These priorities are reflected in the Climate Action Policy of the Alliance for Jobs and Clean Energy. The environmental and social justice issues surrounding California’s pricing mechanism are an important indication of what we need to be attentive to when we assess climate change policies in Washington. We also need a solution that will work for everyone and we don’t have the time to propose or enact vague and ill-informed measures then “fix it later.” Doing so would be a step backward for climate justice.